Murphy will be packing his bags next summer. AFTER MUCH SPECULATION on Tuesday, Ulster today confirmed the signing of Leinster and Ireland back row Jordi Murphy. The 26-year-old has agreed to the move to the Kingspan Stadium next summer and he follows in the footsteps of Marty Moore who joined the province last month. 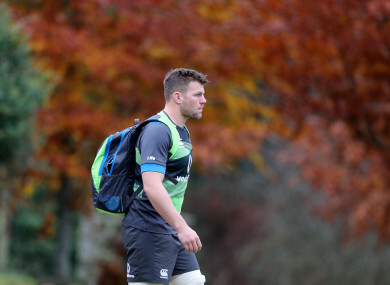 The 18-times capped Ireland international will end his seven-year association with Leinster in a switch that demonstrates his desire to add to those appearances. “”It’s been an incredibly hard decision to leave Leinster, where I have made some great friends and enjoyed some fantastic times, but I am excited by the prospect of moving north and linking up with some familiar faces. “Jordi is a hugely talented player and a very popular member within our squad. It is to his enormous credit that he has come back as strong as he has from his knee injury last year in Ireland’s famous win over the All Blacks in Chicago. Email “Ulster confirm signing of Irish international Murphy from Leinster on two-year deal”. Feedback on “Ulster confirm signing of Irish international Murphy from Leinster on two-year deal”.